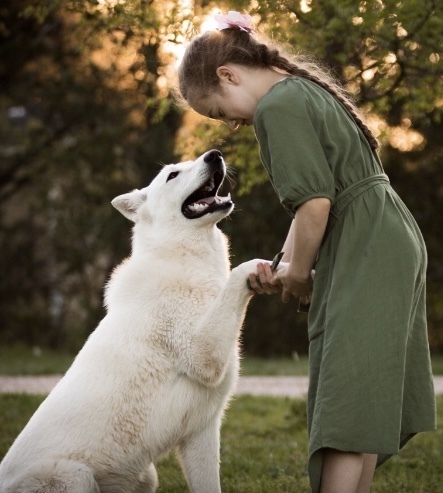 The White German Shepherd is a great family dog. Their mild yet playful temperment and their loyalalty and devotion are excellent qualities for families as well as elderly people looking for a canine companion. Many Veterans have found them to be a great addition to their lives and those who like to hike and run trails have enjoyed their company as well. We have also had puppies go to families to help assist children with autism and other health needs. If you have any other questions that we can answer for you or you are ready to reserve a puppy from our next litter, please call 254-716-5067 or go to our contact page and fill out our form. We work on a first come-first pick basis, in other words, the first one to make a down payment gets the first pick of the litter. Your purchace will not only include your limited AKC registered puppy, but your puppy's shots will be current as well as worming medicines and he/she will have had a full health check by our local vetrinararian. You will receive a health contract with your puppy which I can go over with you personally. I encourage owners to come out and meet the puppies, as well as the parents, and pick out the one that they feel best suits them. If you are unable to do this I am happy to work with you.